Billy Copeland grew up on ranches in South Texas around Beeville and San Antonio. Yes, in the 40s and 50s there were still ranches close to San Antonio! He went to Northside High School and was President of the 1954 class. He was drafted into the army in November, 1954, and served two years in Germany. After the army he went to San Antonio College at night while working during the day. He married Madeline Willard in 1957 and they are still married. They had two sons, Christopher and Forrest. Forrest died on Dec. 9, 1994. Billy worked in middle management in corporations including WWGraingers, Westinghouse and Southwestern Bell, before starting his own businesses. Billy and his wife opened Opulent Advertising in 1976 and purchased San Antonio Fine Arts Center, a children’s live theater production company, in 1978. They opened the Melodrama Playhouse and Saloon in 1982 and Billy wrote plays for both theaters–several of which were repeated several times. Billy opened Copeland Insurance Agency with his son Christopher in 1995, and sold the agency in 1999 when Billy retired. This book had been running around in his head for many years and in 2000 he finally had the time to write it. When nine-year-old James Michael "J.J." Willard finds himself bumping along in a covered wagon, with his father, mother, two sisters and all their worldly possessions, he has no idea of the adventures that lie ahead. His folks had immigrated from Ireland a few years earlier and now the whole family is on the move again, leaving their home in Brooklyn, New York, making their way south to New Orleans, lured by the promise of work. They stop in townships along the way to sell "Willard's Magic Elixir" - an old family recipe - in order to buy food for their journey. The year is 1861 and the war between the states is just beginning. Arriving in New Orleans they are confronted with the full horrors of the civil war, and to avoid being caught up in the brutal conflict the family decides to lie low on a small farm outside the city where they brew their potion and work on their sales patter. They decide to incorporate a few simple conjuring tricks to entertain the crowd and quickly discover that J.J. has a natural gift for performing magic. By the time the war is over the Willards are putting on weekly magic shows in New Orleans and J.J. is the star of the show. Offers start pouring in and before long the talented young magician is performing on Mississippi riverboats and famous clubs all over the United States. Then Europe beckons...But what magic can he conjure up when misfortune strikes his family at home? 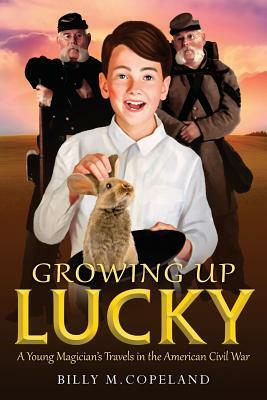 These are the adventures of a young man who grew up lucky at a time of great conflict and against all odds...based on the true life adventures of James Michael "J.J." Willard.